Roman shades are a traditional fabric window covering that adds a soft touch to any room. At Value Blinds & Heirloom Draperies, we carry traditional Roman shades with either looped or flat folds, as well as more modern styles that offer a sleek and innovative look. Hunter Douglas Roman shades provide extra insulation between the outside air and your home, improving energy efficiency without sacrificing style. 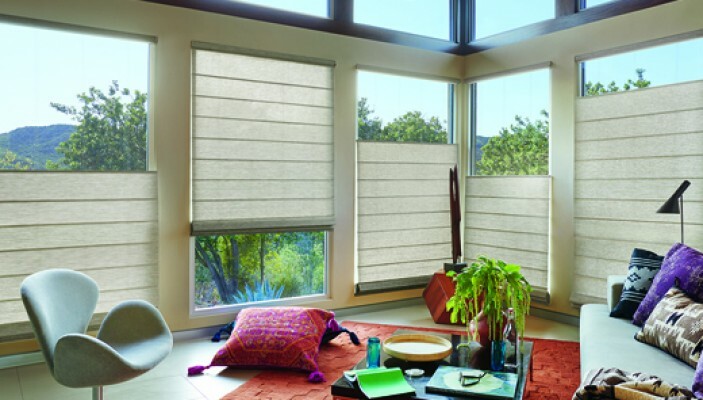 Choose from a wide variety of fabrics, colors and light filtering options such as semi-sheer, translucent and blackout. Classic honeycomb shades combine two or more layers of pleated fabric forming a honeycomb-shaped cell that traps air and provides an extra layer of insulation at the window. Our Hunter Douglas Duette® Architella® honeycomb shades are the most energy efficient shades on the market. Honeycomb window shades are available in hundreds of colors and textures including sheer, soft, batiste, and beautiful metallicized. Our shades and can be made to cover most any window, including, skylights, specialty shapes and more. Room darkening is also available. Shades are available in 3/8, double 1/2, 3/4, and 1-1/4 inch single, double, and triple cells. Choose from retractable cords or cordless operation options. With an understated elegance that adds unique texture, warmth, and interest to any décor, woven wood shades are very popular here in the Washington DC area. Our selection of woven woods includes many fabrics and decorative banding to choose from. Use unlined as a sunscreen or fully lined for complete privacy. Top down- bottom up, room darkening, and motorization options are also available. Made from renewable materials such as bamboo, reeds, and grasses, woven wood shades provide a warm look for a casual interior or can be dressed up beautifully with drapery side panels for a classy, sophisticated room. Gone are the days of the cheap vinyl shades that are difficult to operate. Designer roller shades from Hunter Douglas offer contemporary looks with dozens of patterns, colors, and textures to choose from. Featuring easy cord-lock operation and automated options, roller shades are available in a variety of opacities from sun-filtering to room darkening. Roller shades and screen shades also serve the very important purpose of blocking harmful UV rays from damaging your flooring, furniture, and other items inside your home. The professionals at Value Blinds & Heirloom Designs are committed to bringing you the latest window shade styles, current trends, and innovative technologies. We offer only the highest quality blinds, shades, shutters, and home accessories. With a showroom in Ashburn, we proudly serve the greater DC area, including Loudoun County, Fairfax County, Montgomery County, and Prince William County. Contact us today to schedule a consultation.